When it comes to power hitting, rookie first baseman Matt Olson has enjoyed one of the most impressive career-opening stretches in A's history. He went deep again in Monday night's 8-3 victory over Detroit. 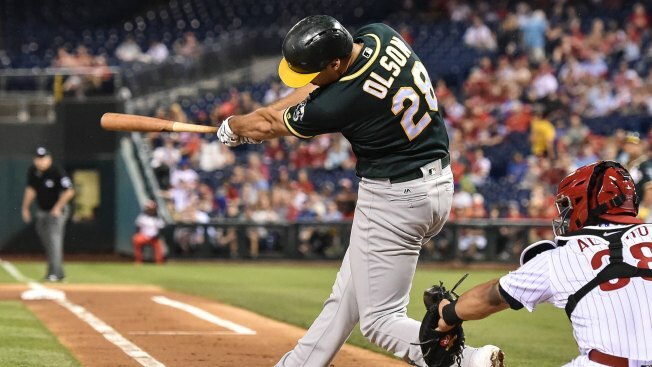 Although he's only played in roughly one-third of Oakland's games this year, Olson has vaulted into a tie for fourth on the team with 22 homers this season. 22 - Olson's 2017 -and career - home run total. Those 22 homers tie Mark McGwire for most in franchise history over a player's first 65 games. 18: The number of times Olson has gone deep since Aug. 11, which leads the American League. 19 - The number of major league games Olson appeared in before connecting for his first homer. That came June 24. Since then, he hasn't gone more than eight games in the majors without clearing the fence. 47 - Olson was the 47th overall pick of the 2012 draft, a compensation choice between the first and second rounds. He was one of a trio of high school infielders Oakland took with its first three picks that year. The others were two shortstops - Addison Russell (11th overall) and Daniel Robertson (34th). At the time the A's said perhaps they had drafted three-fourths of their future infield. But Russell and Robertson eventually got dealt. Now, Olson is part of a different young infield core that could include third baseman Matt Chapman and second baseman Franklin Barreto along with veteran shortstop Marcus Semien. 2: The number of players in the past 30 years to hit 20 homers in both the minors and majors in the same season. Olson has done it this year. Miami's Giancarlo Stanton, who's generating his share of headlines with his own power hitting, did it back in 2010. 103 The number of homers Olson hit over five minor league seasons leading into this year. That included a whopping 37 for Single-A Stockton in the homer-happy California League in 2014. In comparison, the 17 homers he hit each of the next two seasons at Double-A Midland and Triple-A Nashville looked paltry. Olson says he struggled for a while to trust his natural power stroke and not try to alter his approach too much to boost those power numbers. 4: The total number of major leaguers produced by Olson's alma mater of Parkview High School in Lilburn, Ga. The others were outfielder Jeff Francoeur, infielder Jeff Keppinger and catcher Clint Sammons. 14: Olson is tied with a couple of legends when it comes to most homers in a 20-game span in Oakland history. McGwire (1987) and Reggie Jackson (1969) also had 14 over their own 20-game stretches, and Jackson did it twice that season. (Hat tip to A's P.R. stats guru Mike Selleck for several of these factoids, by the way). 23: Remember that Olson is just 23 years old. His 22 homers are the most in a single season by an Athletic 23 or younger since Eric Chavez swatted 32 back in 2001. Chavez also was 23 at the time.